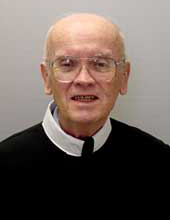 Redemptorist Father Jerome Holland, a native of South Bronx, died Sunday, July 26, at the St. John Neumann Residence in Stella Maris, Timonium, MD. He was 80 years old and had been receiving nursing care over the past few years. A Wake Service will be held at Stella Maris on Wednesday evening at 7 o’clock and the Funeral Mass will be offered there on Thursday, July 30, at 10 a.m. Burial will be at Mount St. Alphonsus in Esopus, NY, at one p.m. the following day. The son of Felix and Mary Kenny Holland, Father Holland was born on Nov. 1, 1928. He was educated at Immaculate Conception School and, in the sixth grade, impressed by the hard work and zeal of the Redemptorist priests there, he found his calling to follow in their footsteps. After completing grammar school, he was accepted as a student in the Redemptorist minor seminary of St. Mary’s in North East, PA. He spent his novitiate in Ilchester, MD, and made his first profession of vows in 1951; his final profession was in 1954. In the meantime, he went on to complete his studies for the priesthood at Mount St. Alphonsus in Esopus. He was ordained on June 17, 1956. Father Holland’s priestly ministry began in Puerto Rico, where he served in Aquadilla (1958-59), Caguas I (1959-64), Aguas Buenas (1964-67) and Caguas II (1967-74). Father Thomas Travers, who preceded Father Holland in Caguas and eventually became Vice-Provincial of San Juan, cited as an example of his confrere’s hard work his efforts at the out-mission of Villa Esperanza. "We had just built a church when I was there, but it wasn’t finished," Father Travers said. It was Father Holland who "finished off the sacristy and the meeting room for parish groups; he finished building the bell tower outside and the shrine to St. Jude." Father Travers added: "He was a well-balanced, happy guy, who did a lot of good work and would often be out visiting people in their homes… The people loved him there very much." In 1974, Father Holland returned to New York, being stationed at Most Holy Redeemer Church in the East Village. Three years later, he was transferred to Immaculate Conception Church in the Bronx, where his facility with the Spanish language and his appreciation for Hispanic cultures were much welcomed in the largely Spanish-speaking neighborhood. After two three-year terms there, he was sent to Our Lady of Lourdes Church in Seaford, DE, a parish the Redemptorists had taken on both for the sake of the full-time residents and for the migrant field workers. Father Holland’s next assignment was back at Most Holy Redeemer Church in New York. Father Joseph Tizio, who was rector there, recalled that Father Holland "had a great sense of humor and was wonderful with the people, both Spanish- and English-speaking. He kept to a diabetic diet better than anybody I know. The only time he broke it was when there was pot roast, his favorite meal; otherwise he never went off that diet! He carried that discipline in other areas of his life, in work and prayer." Another confrere who was with him at Most Holy Redeemer noted that Father Holland was "a great fan — as in fanatic — of sports. "He favored the Giants baseball team, which used to play at the Polo Grounds, and the Giants football team; he rooted for the Knicks in basketball and the New York Rangers in hockey." During Father Holland’s tenure in the East Village, the area was a tough place for outreach ministry due to the growing incidence of drug use and dealing. After a nearby crack house was raided and ordered torn down, he was very supportive of community efforts to turn the lot into a garden. Maureen O’Neill, who was in residence at the parish while serving as a Redemptorist Lay Missionary, said Father Holland "loved to tell jokes and he had at least one everyday and one for every Sunday he preached. The congregation loved it." At the age of 75, Father Holland was transferred to Our Lady of Perpetual Help Rectory in Manhattan. Father Francis O’Rourke, who was rector then, said that "a lot of people forget this, but he was one of the reasons we have the Mass in November for deceased confreres up at Esopus." It was especially important to Father Holland because an older brother, Father Charles Holland, was then among the deceased confreres. Father O’Rourke added: "He was a nice fellow, good to have around, a lot of fun. When he was here, though, the doctor was concerned that Jerry was getting confused." To provide increased care for his health needs, Father Holland was transferred to St. John Neumann Residence in Saratoga Springs, NY, where he could get residential nursing care. When the Baltimore Province closed that house recently, he moved, along with many of his confreres, to the new accommodations at Stella Maris. Rev. Jerome Alfred Holland C.Ss.R. Viewing from 6 to 8 p.m.